This blog is being put on pause; that is the gist of this post. But that does not mean the end of Mid-Town Eden; I will not let all of the work that others and myself have put into this project go to waste. I will still be cutting and pulling weeds when I can to make it so that when the next growing season comes around it will be much easier to start things up. But at this moment we are coming to the end of our growing season and I will be gone for all of August. Now if you read my last post you would have seen that I did indeed plant a tiny patch of lettuce and carrots and I did have a pretty good amount of sprouts coming up, but as some of you may know I cannot be there all the time and one of the weeks I was away it wasn’t watered and all the sprouts that I had died. I watered it for the next week hoping that something might come up, but nothing changed. I apologize that after the huge amount of work that some of you have done that there isn’t anything that has happened to it, but a I will be trying to keep the weeds down and making little improvements before next growing season so that we can have a more full fledged garden next year. It isn’t much but hopefully by summers end this little plot will give me a salad or two. In the two bags there is lettuce and in-between there is carrots. Which have just begun to sprout. Two more things I would like to mention in this post. One, it came to my attention that in one of my previous posts I wrote something that was offensive to some. I feel really bad about this and made all the changes I saw necessary, but if you see anything else that may need adjusting a comment would be great. Two is that this isn’t going to be a huge project, I set out with the idea of Mid-Town Eden being isomethingI worked on slowly from time to time when it was convenient for me, and I plan to keep it that way. I am really sorry that I haven’t posted anything or done anything really since the work party, but it is the end of the school year and that of course means that everybody (teachers included) is playing the catch-up game and loading everything on at the last moment. My cousin’s wedding also took place this week and I got sick on Saturday, but I promise that after the school year is over I will dedicate at least one of my three free days I have, before I leave again on a trip, to just the garden and hopefully I will get a lot done. 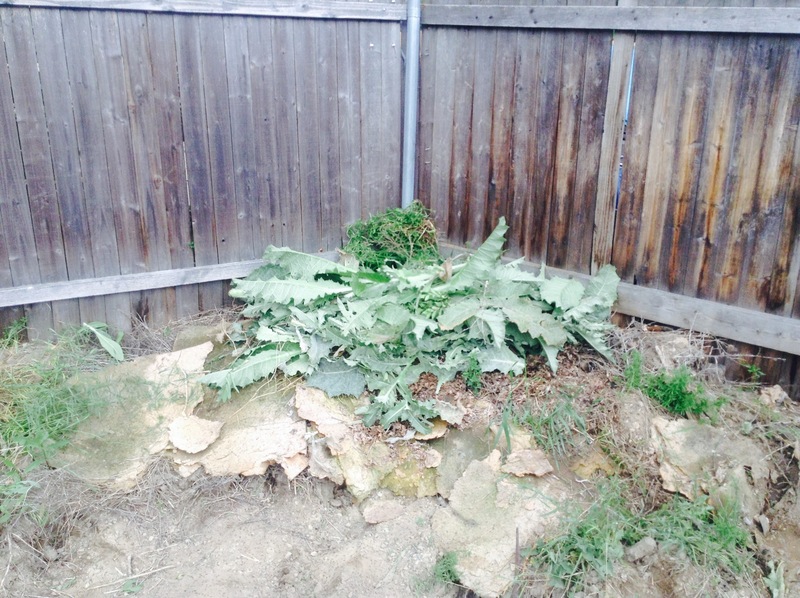 I did try and do a little today though so I did some weeding and cut down 4 giant thistles before it started raining. Even thought these things are complete pests, they amaze me with their size. So again, sorry for the lack of progress, but more will come very soon. “Thank you” doesn’t nearly describe the gratitude that I have for the people that came yesterday to help me turn this dream into reality. A ton of progress was made yesterday, and the people that came put in a ton of work. 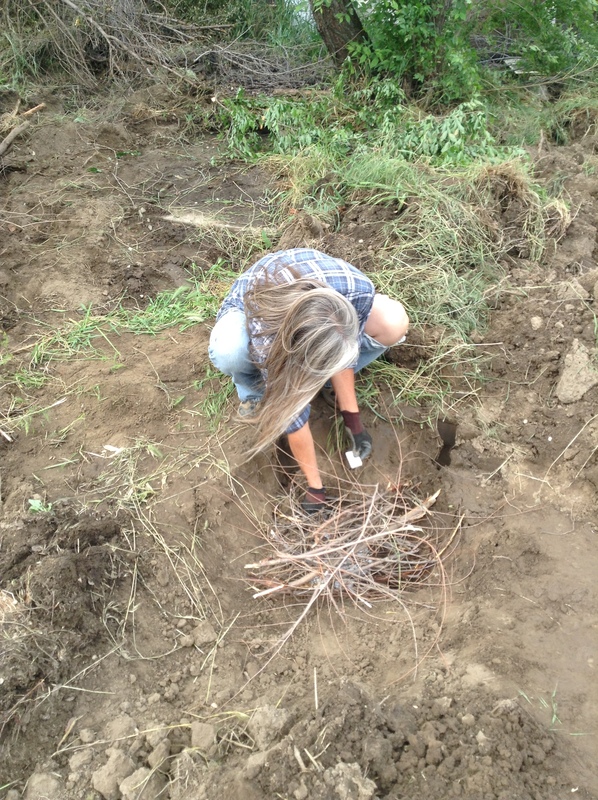 Me and My mother arrived there about 10:15 and built a little fire pit so that we could start burning the not-so-small pile of dead tree limbs. 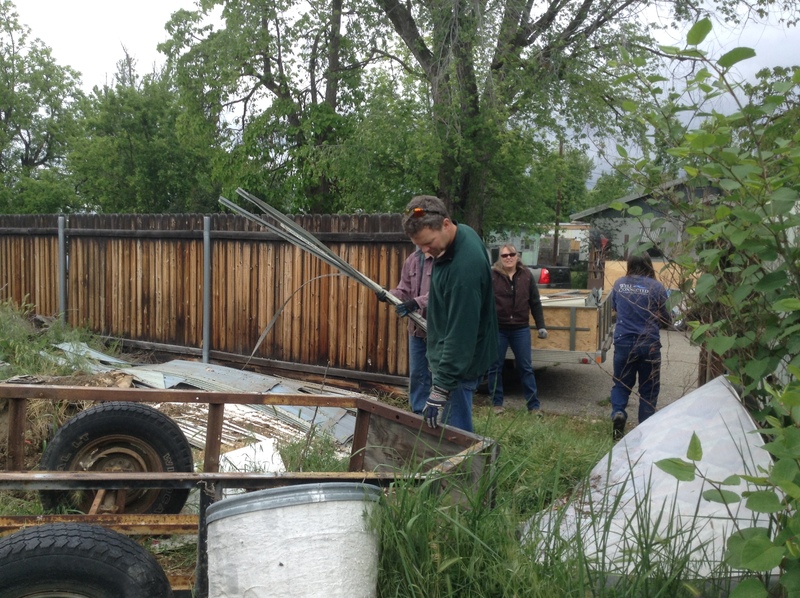 At about 11:30 the first people arrived and we started to fill up their trailer with the plastic siding. Not 20 minutes later the other two people arrived. We very quickly got through the plastic and started to attack the other random pieces of trash. 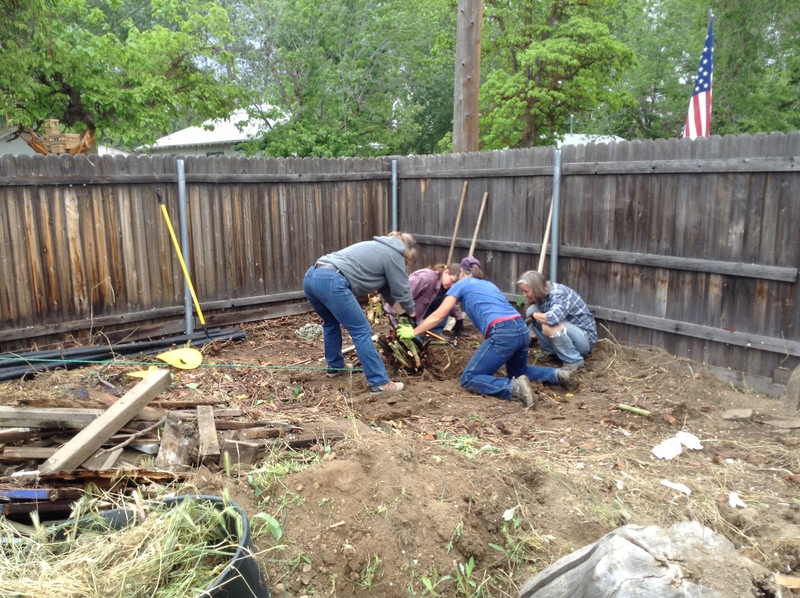 Then we started on the bamboo/weed/bush thing that was slowly taking over the corner of the lot. It actually came out a lot faster than I thought it would. So even though this doesn’t sound like much for a day; it was actually a ton. 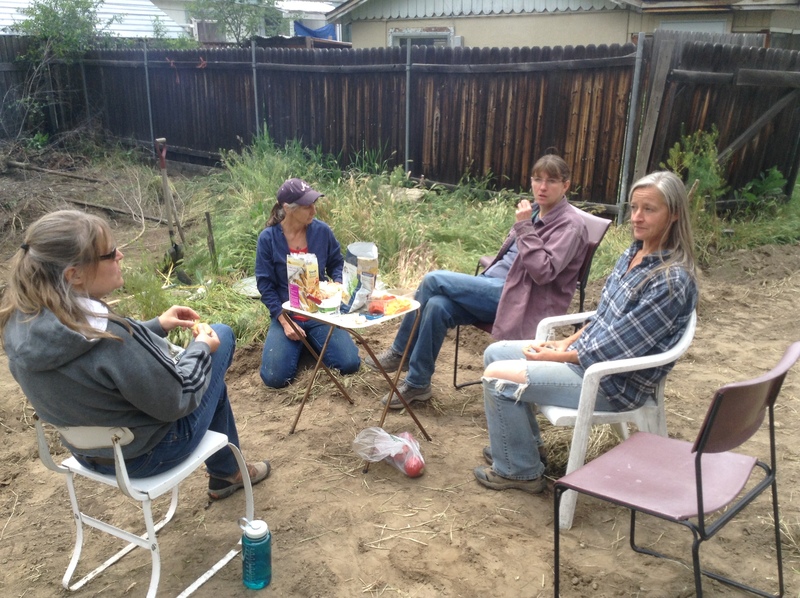 And after we finished tidying up the last little bits and pieces we sat in a little circle with snacks and drinks. It was an amazing day and like I said before, no words can describe the gratitude that I have for the people who came and helped me. I thought that this lot would just be a little side project of mine that I would work on very slowly with something done here and something done there. But now I can see that it will become something much bigger and much more beautiful. P.S. The top picture is the “Before” picture and the bottom is the “After” picture. Not a big post, just a little update on tomorrows work party. I was trying to wait until I knew pretty well what the weather might look like on Saturday. It looks like there is a 40% to 50% chance of rain until noon, and some people have already let us know they aren’t coming till then. My mother and I will still arrive there earlier in the morning, but we don’t expect anyone to arrive until noon. Any help would be awesome! Finally something very visual and big has happened. And even if I don’t like it since it killed all the grass and other plants it will make turning this lot into a garden a ton easier. And to go with this on Saturday there will be a “work” party and I put quotations around work because I don’t want it to be a chore. 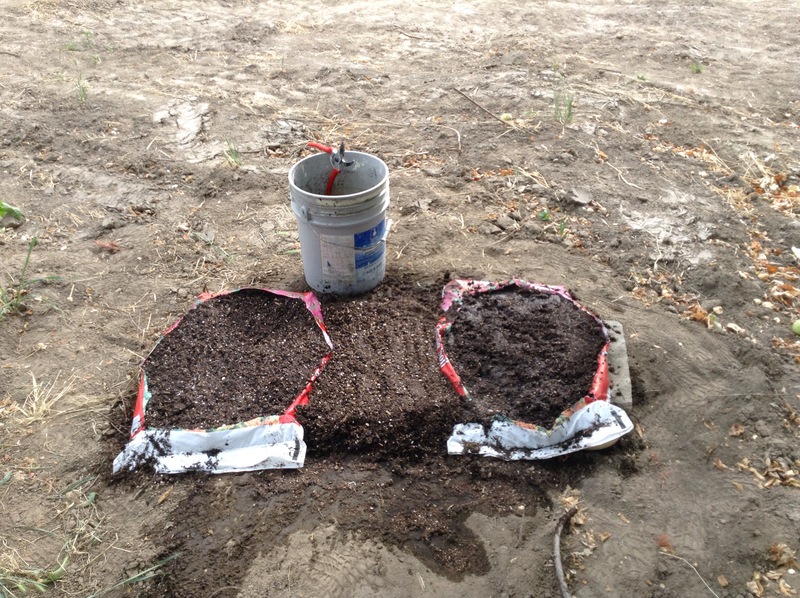 I am still ironing out the details, but my basic plan is to start this whole process by doing bag gardens where you plant shallow rooted plats straight into the bags and then I between those bags you lay cardboard down and then hay on top of that or grass clippings. So if you have any bags of top soil, extra cardboard, and/or straw or grass clippings that you would be willing to give to this project that would be amazing. And if you do this you will have access to the garden if you would like it. Then there is also the trash that is still in there, we already have one person coming that will take a lot of it up to the dump, but if anybody has some trashcans they could bring that would be just dandy. 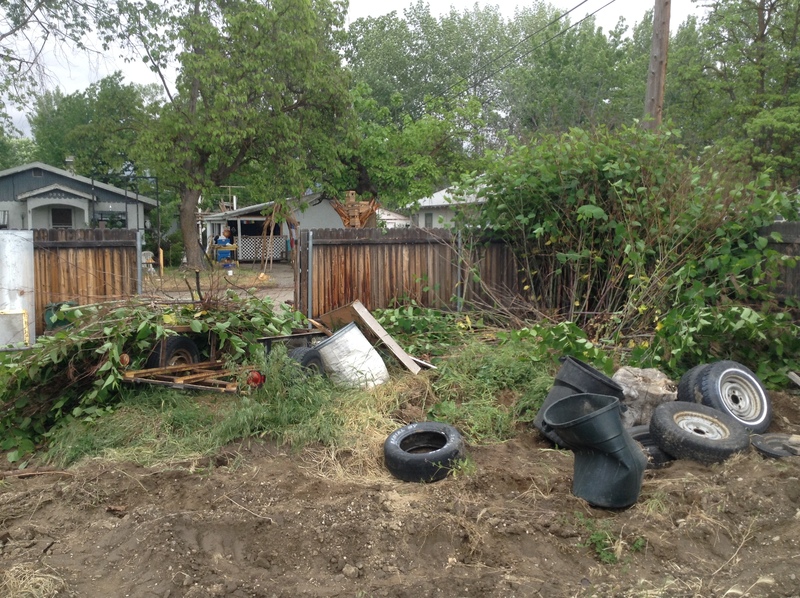 The garden is in Garden City just off of Chinden on Carr street in between 33 and 34 street, if there is any trouble finding the lot you can call me at (208)-914-8714, I will try to have my phone on me as much as I can. Thank you all who even just glance at my blog, because for me just seeing those few views every day gives me encouragement and the energy to keep going with this project. Sorry, I know I said that I would get a few posts up this weekend and I am only posting one and it isn’t even the weekend any longer. Anyway the weekend was much more packed than I expected and I only had about 2 hours in the garden. 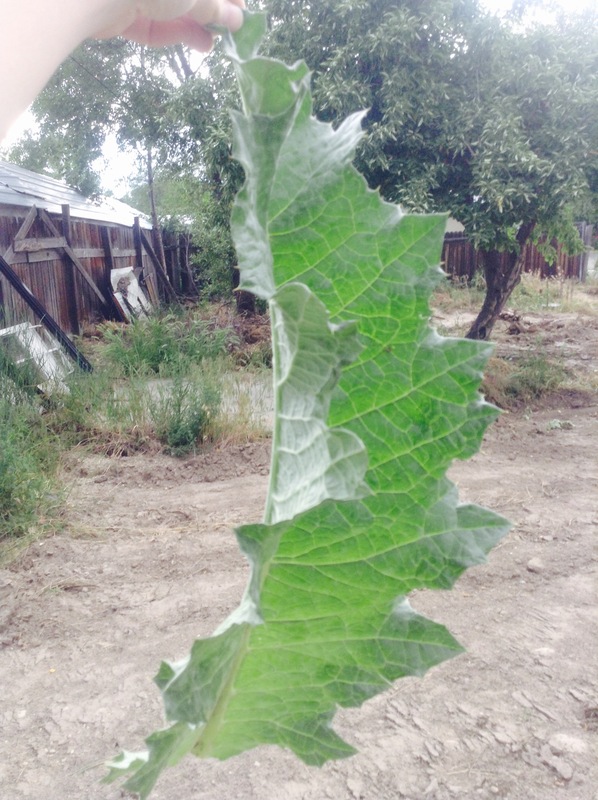 I picked a ton more thistles and pulled weeds from the old ditch so that when we start irrigating water can flow freely. It was also very beautiful, it was like over night all o the plants in there decided to bloom, the pictures don’t do it justice, but it really was amazing. Sorry again for the lack of posts and progress, but I hope that really soon we will be able to test the irrigation and get some water into the lot because that ground is hard as a rock right now. Note: The top is before, the bottom after. They’re baby thistles and they are EVERYWHERE! But if I just keep picking them they will go away… I hope. If you know any good ways to get rid of these things a comment would be awesome. Any way not too much to write about, but this weekend I will be doing a lot of work and a few posts to go with that. This is my favorite place in the lot, I love to come home after school and just sit in the little swing. Some people might want to bring a book or listen to some music, but I prefer to just sit there and pet the grass (ya I know that sounds a little weird). Or I will climb up in the little V in the tree with my head in the branches and feel like some spy because no one can really see you, but you can see them.